Purpose: Use this document as a reference for adjusting asset information in ctcLink. 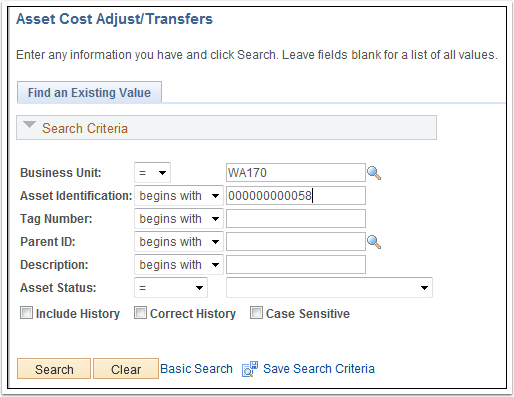 The Asset Cost Adjust/Transfers page can be used to correct asset information errors. Enter the asset in the Asset Identification field. Note: If you don’t know the asset ID, you can continue to enter search criteria, and after clicking the Search button, select the appropriate Asset Identification number from the list provided. Note: The search results takes you directly to the Main Transactions page for the selected asset. Use the Action drop-down button to select the ‘Adjustment’ option. Note: If the asset you are adjusting is a parent or child asset, you will receive a message letting you know that there is an associated asset. Click the Ok button to acknowledge the message. If necessary, adjust the quantity in the Quantity field. Enter the new adjusted cost of the asset in the Cost field. Note: The system automatically adjusts the values in the Quantity and Cost fields by the amounts specified in the Adjust All Rows By fields. Next, navigate to the Cost History List page to review the asset information.